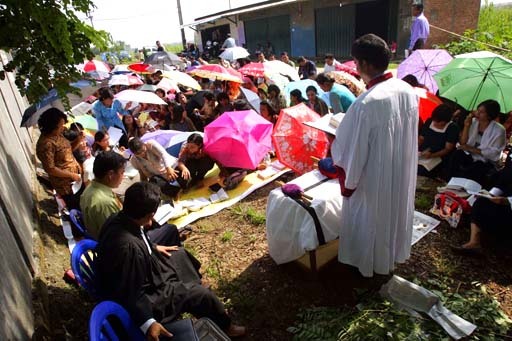 The Hkbp Filadelfia Protestant community again targeted by extremists during Sunday services. At least 400 people surrounded the area and throwing sewage, used oil and eggs on the congregation. Christian leader: not even the police can protect us from attack. A mob of Islamic extremists struck again the prayer house of the Hkbp Filadelfia Protestant community (Protestant Christian Batak Church) in Bekasi, a suburb of Jakarta (West Java), despite the presence of the police deployed to defend Christian worship. The assault took place yesterday morning, while the faithful gathered for Sunday celebrations. On May 17, coinciding with the feast of the Ascension of Jesus, the place of worship was attacked, during which the fundamentalists hurled stones and bags full of urine against the faithful (cf. AsiaNews 18/05 / 2012 Muslim extremists throw stones and urine at Bekasi Christians). Local witnesses report that yesterday - on the arrival of the Faithful - a group of extremists blocked access to the "Church Street ", forcing people to abandon their motorcycles and cover the last part of the journey to the place of worship on foot . The police were deployed around the perimeter of the building, to allow the smooth running of the function, but a crowd of about 400 extremists "surrounded" the area and started to rant against members of religious minority. Among the fundamentalist group there were not only men but also women and children. After the threats came blows. The crowd began to throw water, sewage, used oil, mud, rotten eggs, sticks and other blunt objects. A "brutal" attack aggravated by the presence of a swarm of "infiltrators" who has passed the cordon of officers and attacked the faithful of the Christian community the "from within". Reached by AsiaNews, the Rev. Palti H. Panjaitan Sth - head of the Protestant community Hkbp Filadelfia - emphasized that "what scares us most is that the number of police was so small compared to the angry mob." He adds that "it is clear that they did not have the strength to repel the attackers" and journalists, activists and lawyers who fight in defence of human rights can do nothing either.